On Saturday, February 20 IBB Polonia will play with Malory Eagles for the finals of the domestic cup competitions. The match will take place in the hall of Brentford Fountain Leisure Centre in West London. – We want this meeting to be a celebration of volleyball in London. – says Bartek Łuszcz, a chairman of the IBB Polonia. – The fans are preparing to express the significance of the meeting properly to match its importance. We, in turn, want to repay the fans for their support, which we received in every match, both at home and away. That is why we have prepared rewards that will be drawn among those who will be present at the cup tie with Malory Eagles. – The chain stores of Maja Polish Deli prepared rewards in the form of vouchers for purchases of £ 30, £ 40 and £50. DFDS ferry lines offer a VIP ferry cruise on the route Dover – Dunkirk – Dover, whilst the restaurant Tatra Shepherds Bush is open for dinner for two people.- adds Łuszcz. In the league competition IBB Polonia has been unbeaten since the beginning of the 2015/2016 season. Last weekend superiority mantees of Vangelis Koutouleas have to be recognized by the London volleyball team of Lynx. 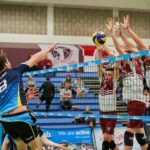 After an exciting struggle in its own hall, IBB Polonia won 3-1 (25:20, 22:25, 25:16, 25:12). – Rival played at their maximum ability level, but after the first two sets all their strenght ran out. – says Koutouleas. – By winning the third and fourth set respectively to 16 and 12 we confirmed our abilities. However, we must jump to conclusions about the beginning of the match. As always, there is still a lot of work ahead of us, we do not fall for euphoria, but conscientiously preparing for the most important meetings, which are just to be faced. IBB Polonia is a leader in Super 8 League table, having 31 points in their account. In the second place is Team Northumbria (24 points), in the third position is volleyball club in London Docklands (17 points). About IBB Polonia date onwww.polonia.vc and Facebook www.facebook.com/poloniavc.